Jorge Mario Bergoglio has chosen the papal name ‘Francis’, which will suggest to most Catholics the founder of the Franciscan order, Francis of Assisi. Pope Francis’ gentle and unassuming style, his poverty – if catching the bus and cooking one’s own meals really qualifies as poverty in the Latin American context … – point to the medieval Italian saint who preached to the common people, and legendarily, to the birds. But Francis was also half the name of one of the Jesuits’ earliest saints, Francis-Xavier (1506-1552), the fervent and restless ‘Apostle to the Indes’, who took Catholic Christianity to India, Japan, and the East Indes in the early modern period, dying of a fever just fourteen kilometres from the shore of mainland China. Perhaps Pope Francis quietly gestures to this sixteenth-century Jesuit missionary, too, who has come to represent the global reach of the Catholic Church, and embodies the evangelical zeal for ‘harvesting souls’ which fired so many members of his order in the early modern period. 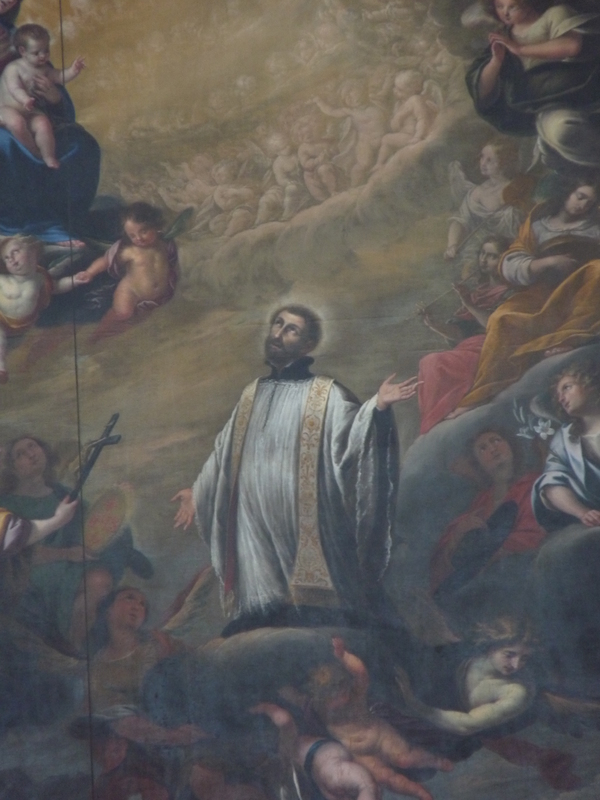 Torriani, Saint Francis Xavier (detail from an altar painting), 1681. Jesuitenkirche St. Franz Xaver, Lucerne. Wikimedia Commons. So who were the Jesuits? The Society or Company of Jesus was a Catholic Reformation order founded in 1540 by Basque nobleman and former soldier, Ignatius of Loyola, and a bunch of his student friends (among them Francis-Xavier). They quickly earned a formidable and paradoxical reputation. The Pope’s crack troops were deployed from Messina to Macao, Paris to Paraguay, recruiting converts, fighting the spread of Protestantism, and educating the élites of Catholic Europe and her New World colonies. They conducted diplomatic business and scientific research, composed music and poetry, and shocked and awed audiences with theatre and pyrotechnics, art and architecture. Jesuits were prepared to die for their beliefs in faraway missions, but they were also accused of being slippery and self-serving. They championed native Indian rights, but enslaved Africans. In their ranks were to be found hard-nosed heretic hunters, as well as defenders of the rights of ‘witches’, and believers in ‘natural magic’. Renowned for their chameleon-like ability to adapt to local circumstances – dressing as mandarins in China or brahmins in India – the proud and powerful ‘black robes’ couldn’t help but stand out on Catholic home turf. Victims of their own success, the Jesuits were hounded out of France, Spain, Portugal, and the New World. The ‘Old’ Society of Jesus was shut down by the Pope in 1773. 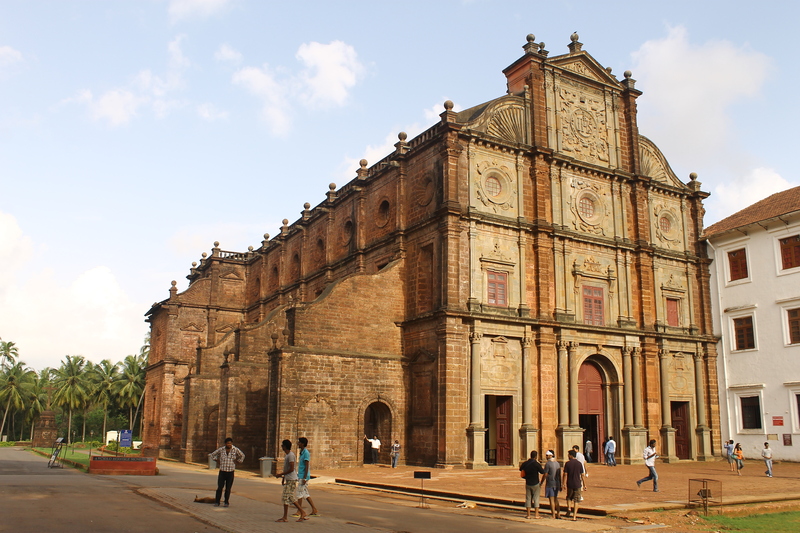 Church of St Francis Xavier, Old Goa, 1605. Wikimedia Commons. The Society of Jesus was restored in 1814 and has regrown to become the single largest order of the Catholic Church. The ‘New’ Society has produced its fair share of arch-conservatives, but also Nazi-resisters, freedom-fighters, and liberation theologians. It retains its former reputation for education and intellectual sophistication: the profile of a twentieth-century polymath such as Pierre Teilhard de Chardin (philosopher, mathematician, palaeontologist, and evolutionary biologist) would not look out of place alongside those of Athanasius Kircher (speculative vulcanologist, biologist, orientalist …) or Roger Boscovich (poet, physicist, astronomer, diplomat …) in Carlos Sommervogel’s great bio-bibliographical dictionary of the Old Society (Bibliothèque de la Compagnie de Jésus). But the heart has always been just as if not more important than the head in Jesuit theology. Much of the order’s thinking, historically, has gone into questions of how to rouse, channel and discipline the emotions. Ignatius’ Spiritual Exercises remains to this day the beating heart of the Society of Jesus, anticipating some of the techniques of modern psychotherapy in its guided visualisations; its call for attention to and daily written reckoning of our desires and defects; its rules for ‘discernment of spirits’ (in effect, how to listen to our emotions before making important life choices). In conjuring up in detail the agonies of the Passion, however, not to mention a sense-by-sense experience of the torments of Hell, Ignatius is a world away from modern secular philosophers of emotional well-being and intelligence, and from mental health regimes that seek to eliminate anxiety and depression from our lives. The exercitant of the Spiritual Exercises moves inevitably between states of ‘consolation’ and ‘desolation’ with no more human control over this process than that of preparing him/herself in advance for the next turn of the wheel.